Well, this is an exciting bunch of stories! Google lets it slip that click data influences rankings. Whodathunkit? Google is ending First Click Free apparently. Booo. Links are as important as ever for Google Rankings. *Shock*. iOS 11 will be linking to canonical AMP URLs thank you very much. Phew. Google releases a very basic guide to m-dot to responsive site migration. Errrr. And a whole heap of interesting and entertaining SEO Bits & Pieces. 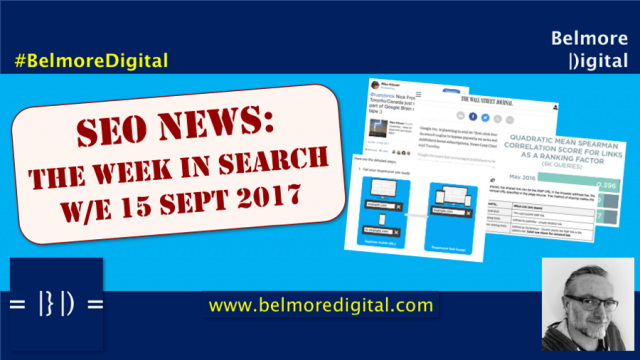 Read the SEO News and Updates for w/e 15 Sept 2017 now. Awww, the cuddly old Google is apparently allowing news publishers to opt out of First Click Free and *not* lose news rankings. This is to help keep the poor old news publishers afloat. According to the Wall Street Journal (not free, therefore not linked) this deal was hashed out by the Google CEO and the News Corp CEO (News Corp own WSJ, lest we forget). Nothing has yet been formally announced. This is inline with my recent stories: Google Testing New Subscription Options for Publishers, and Google News Facelift After 7 Years, and Wall Street Journal 44% SEO Traffic Loss. If First Click Free goes news publishers will need to leave things as they are. Or they can update their systems so that nothing bar a headline is given away for free. Either way, publishers would need to weigh up the commercial implications of dropping First Click Free – potentially higher subscriptions vs potentially lower traffic numbers. Click here to contact me to discuss ways to use First Click Free and ways to monetise traffic. Rupert Murdoch, owner of News Corp, and ultimately owner of the Wall Street Journal is not widely known for his unfettered support of competitors. If the WSJ is making such a great job of its turn away from First Click Free, you’d have to wonder why they would be entreating Google to ditch it. When you apply some brain cells to the issue, if they are making a fortune, their competitors are not getting any of those forced subscription dollars. Why spread those dollars around more thinly? But I could be hugely mistaken and WSJ has the widespread interests of news publishers at heart. Google kind of does. It knows if publishers go to the wall, then it will be left with fake news, bloggers and uninformed commentary of the wildest proportions. I do think the news publishers need to find a way to survive, but comparing the quality and location of their offices to mine leads me to wonder if they couldn’t trim the fat. Just a little bit. Links are as important as ever for Google Rankings. Stone Temple Consulting have just released a rather swishy report showing links are as important as ever for Google rankings. This may have been what their study set out to show. They used Quadratic Mean Spearman Correlation Scores and everything. Even though Google would love everybody to stop building links, I think we all know they still work. Review the findings of the Stone Temple Report. Come to your own conclusion if it is earth-shattering, or not. Continue to work on acquiring good quality relevant links. Click here to contact me to discuss how Google uses links in its ranking algorithms. This is a decent enough study, but it is filled with holes large enough to drive a small bus through. 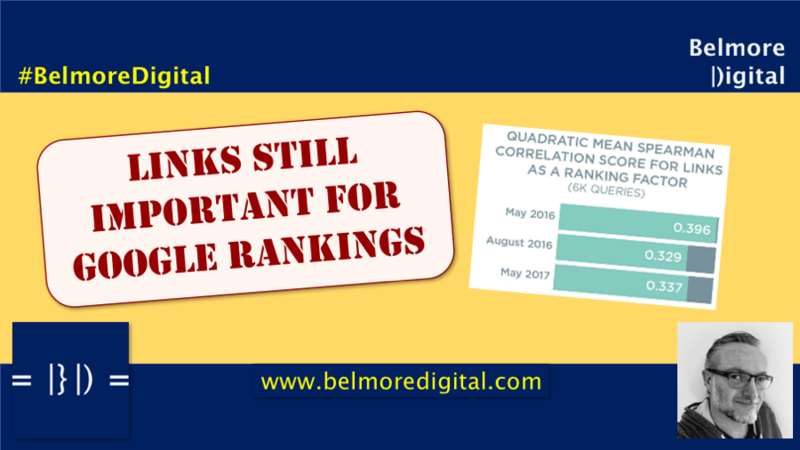 At the top level, there is still a degree of correlation between links and rankings. But remember correlation does not always mean causation. My issues with this report are as follows: the quadratic mean scores all sound good, but I’m not convinced they add an awful lot of value beyond sounding fancy. I’m not enough of a mathematician to argue the finer points of one type of score versus another. We’re not shown the raw data unfortunately, so it is hard to judge. As a mathematic calculation, it only takes account of the number of links. Those links it should be noted were found in an external toolset, not Google. Building links by numbers is generally a bad idea. The report also doesn’t mention quality of links (pure authority, or topic authority sites), link placement (higher = better), relevancy of links (relevant page, or relevant anchor text) and finally forgets to look at RONLA (rate of new link acquisition). Most or all of these factors go into Google’s computations, so a bare number leaves one feeling slightly empty, if I’m honest. Nice equations though. This is a good bit of news, in that if you share an AMP URL on iOS11, it will share the canonical URL (usually the desktop URL) rather than the AMP URL. A small thing no doubt, but really useful. No longer do I have to share a clunky, ugly page, I can now share the glorious technicolour desktop. This will also mean that less traffic and value will accrue to the AMP URL. Google also won’t have to sort out the AMP canonical URL for pages linked elsewhere. You don’t need to do anything, except start using AMP and making sure your AMP canonical URL is correct. You should also make sure your AMP analytics are being tracked correctly. Currently it’s a bit of a mess. If you get a lot of shares via iOS on your AMP pages, you should expect to see traffic to the AMP pages decline and the AMP canonical go up commensurately. Click here to contact me to discuss implementing AMP URLs..
At times you wished all the major browsers and OSs moved, if not in lock step, then at least in the same direction. It can get quite frustrating and confusing knowing which does what. As I’ve said before, I think AMP is a good solution, but a temporary one. Having said that, temporary in terms of the internet can be five to twenty years. I think this is a good move, and it would be great if all the apps also moved in the same way. I have a feeling this will only apply to Safari and Apple native apps – I don’t know if the URL sharing function is pulled from a central Safari repository on iOS, or if each app has to code their own. AMP would be a lot easier if it were a straight-forward integration. People on big CMSs (like WordPress) are generally okay, but those on custom, or modified, are likely to be in a world of pain. The very basic basics are there (create a responsive site, 301 redirects, drop mobile-specific config), but the rest of the useful stuff? Forget it. Really if you want to migrate properly (and it is a website migration) you need to read my post on: How to do an SEO Website Migration Properly. Read the Google piece. The read my SEO website migration tutorial. Mine’s much better. Basically, prepare your move as if you are doing a full website migration. It’s quite important. Go responsive, but don’t forget to design mobile first. If you follow Google’s advice only, contact me to help you recover SEO traffic and rankings. Click here to contact me to discuss migrating your website from m-dot to responsive. Ahhhh memories. Sometime ago back in 2012 we moved our first major website to a responsive set up, Even then it felt like we were behind the times, and pretty much every migration since has been from an old school desktop site to a new school responsive design, with a few m-dots in the mix. You need to concentrate on moving to a responsive site in line with Mobile First Indexing as well as going HTTPS while you’re about it. Once you done that, you can leave your web developers alone for a little bit. In unsurprising news,. Google is appealing the EU $2.7 billion fine for its shopping service. Only the fine mind you, Google has already caved to the EU. That’d be a corporate play to delay payment by a long, long, long time. 10 years, maybe even longer. Google says “boiler plate content is not harmful or toxic”. Unless it’s chock-full of spam possibly. I don’t know where webmasters get these ideas from. Google says “ignore the cache date” when looking at its cache. Well yes, that’s not the last date crawled now is it? It’d be helpful if Google gave us the last crawled date, but no, you have to trawl through your log files looking for that, and then go through looking at the rest of information you can pull from there. H/T That John Bloke, on that Twitter thing. Not that we could ever see this coming but The White House has had its Google Questions and Answers turned off. I think there may have been some rude and silly commentary. Honestly, could the naive idiots good folk at Google not see this coming? Yelp is currently bemoaning Google crawling, indexing and then serving its images in Google search when users search for something related to that business. This is part of an ongoing dispute between the two centring around the fact that Google swipes images from sites, specifically Yelp’s here, willy-nilly. 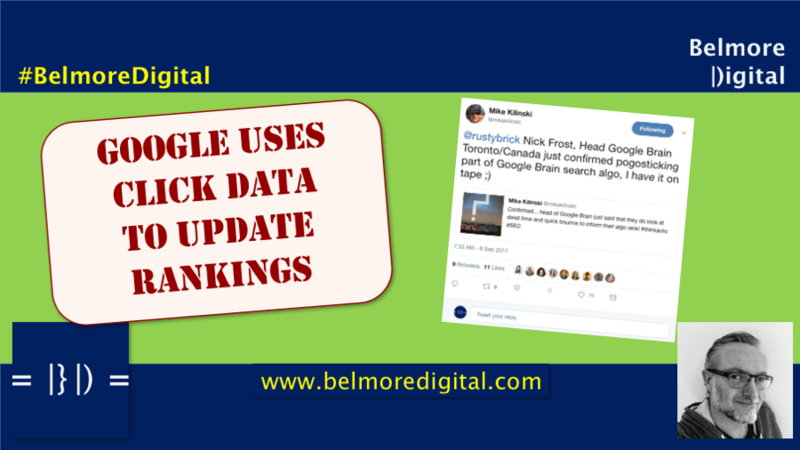 In other news Google has finally admitted, after long drawn-out arguments, wailing and gnashing of teeth, that changing your HTML code can impact your rankings. Well, there we go. That’s one mystery of the universe solved. John Mu spills the beans on Twitter. Results getting clicked on in SERPs may cause Google to change their ranking. 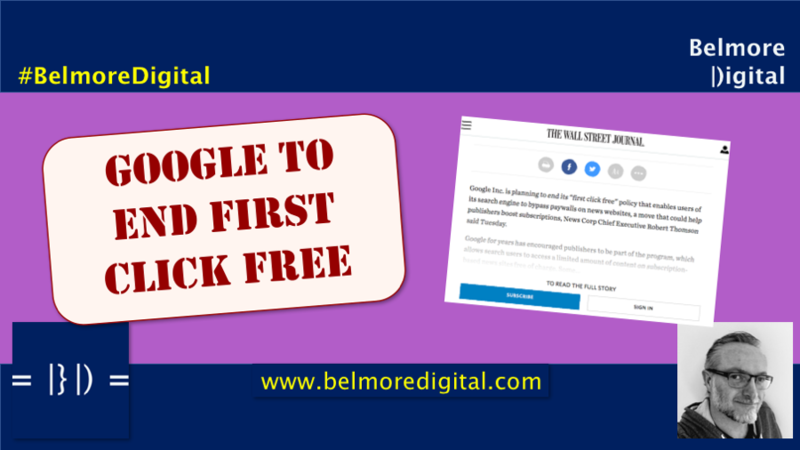 First Click Free may be ended by Google. Boooo. Study into whether links are important for rankings by link generating agency finds they are by using very fancy mathematics. iOS 11 will link to the AMP canonical URL. Phew, we can sleep easy at night. 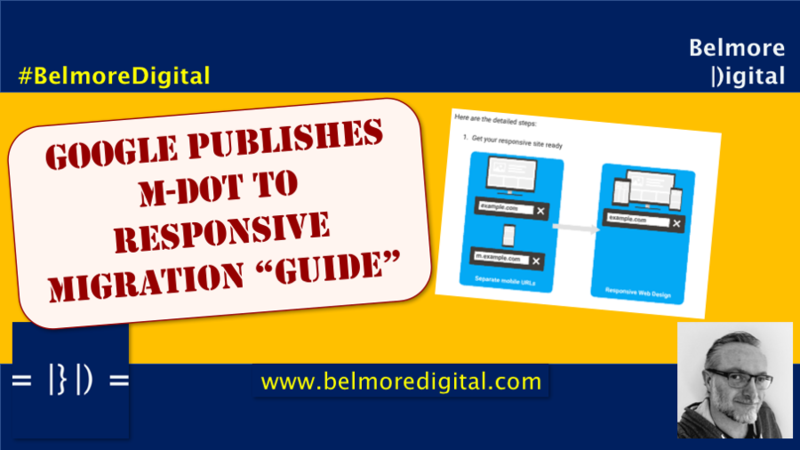 Google produced a really poor guide to moving from an m-dot to a responsive site. Could do better. Funny SEO Bits and Pieces, which made me laugh.